This clip seems to appear and reappear on Youtube. It’s originally from the Ritmo y Geografía del Cante DVD series. The earliest steps taken by artists such as Moraíto, La Macanita, Remedios Amaya, Carmelilla Montoya, Antonio de la Malena and Carlos Heredia, who fascinated their relatives, friends and neighbours with their gracefulness and self-assurance from a very young age. They are unique performances that provide some of the keys for understanding the transmisssion of the heritage of flamenco culture. The moon has a halo; my love has died. Cerco tiene la luna; mi amor ha muerto. …Behind these poems lurks a terrible question that has no answer. Our people cross themselves in prayer, look at the stars, and wait in vain for a sign of salvation. The gesture is pathetic but true. And the poem either poses a deep emotional question with no answer, or solves it with death, which is the question of questions. If you are in the Bay Area, you might consider checking out this event. Main Event at Croatian American Cultural Center, 60 Onondaga St (map) , 7:30 – 11:30 pm – Dance workshop, followed by live music and dancing. $15 or $20 with after-party ticket. Features Rumen Sali Shopov with Brass Liberation Orchestra, and Orkestar Sali with special guests Chris Bajmakovich and Cele Paskoski. Have dinner at the event – super Balkan food by Christo Kolev available for purchase. After-party at Bollyhood Café, 3372 19th St. at Mission (map), 9:00 – 2:00 am – DJ dancing, then live music at midnight with the featured artists. $10 party or $20 combo ticket for both events. International Roma Day (April 8) was officially declared in 1990 in Poland, during the fourth World Romani Congress in honor of the first major international meeting of Roma representatives, 7-12 of April, 1971 in London, UK. Since then Roma around the globe celebrate our social origins, language, culture, unity, and in particular, romipen (preservation of Rom identity) near the date of the original gathering. 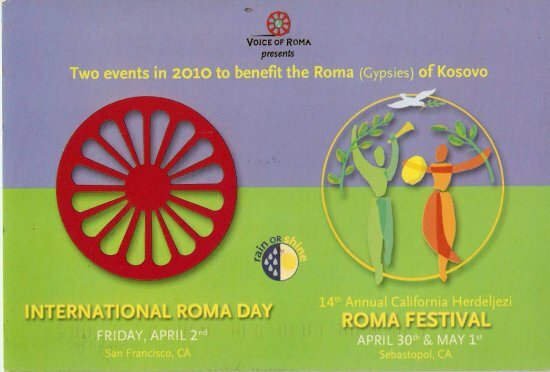 VOR held San Francisco’s first annual International Roma Day event in 2000. In addition to romipen, our goals are to introduce audiences to and provide performing opportunities for renowned Romani performing artists, create a gathering place for Romani and other immigrant and refugee communities, and raise awareness about the human rights issues faced by Roma in today’s world. In particular, we focus on education regarding the dire circumstances of the Roma in and from Kosovo. Romani traditional culture around the world and specifically in the U.S. is weakening. Old neighborhood communities, so nourishing to the culture, are disintegrating. Many young Roma don’t do traditional dances, and some young Roma don’t even share a language with previous generations of their families. This erosion of cultural identity and collective memory could easily result in the loss of Roma artistic expression and traditions that are infused with hundreds of years of history. VOR’s International Roma Day celebration events respond directly to this need. The artists and Roma participants reconnect through their participation, strengthening ties to their culture and preserving the artistic expression of our people. Happy International Roma Day! Djelem Djelem is considered the unofficial anthem of Roma/Gypsy people worldwide.